Hey friends! 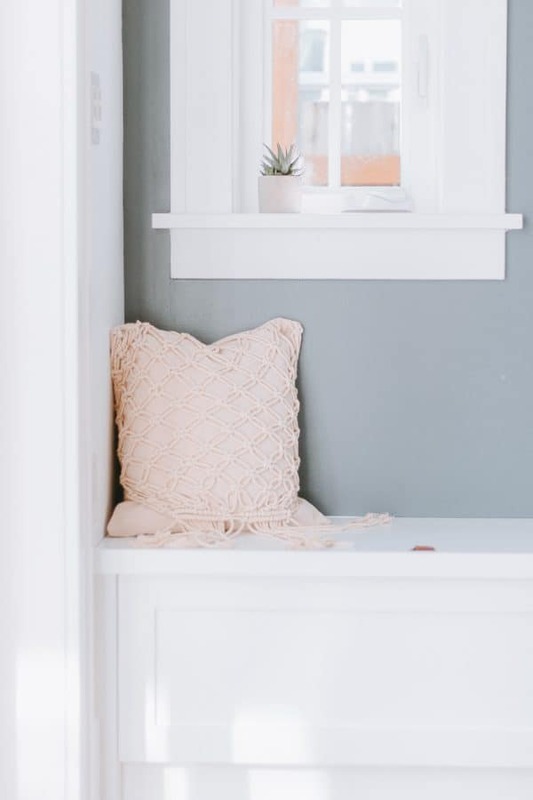 It’s been a full week of Macrame projects – I hope you have enjoyed it so far. 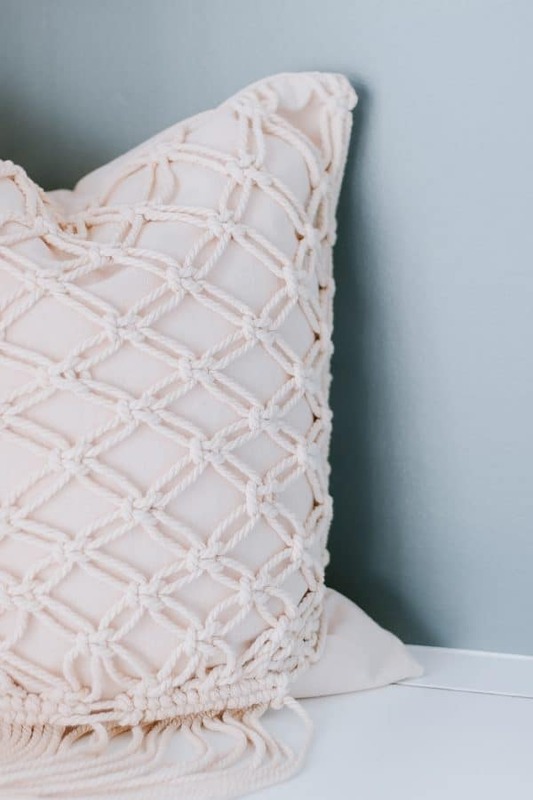 Today is our last and final project – this pretty DIY Macrame Pillow. It’s not as difficult as you think – the hardest part for me was cutting the long cords! Once you make your pattern, you simply detach it from your dowel and reattach it to your pillow. It’s really that simple. I’ll show you how I did it. 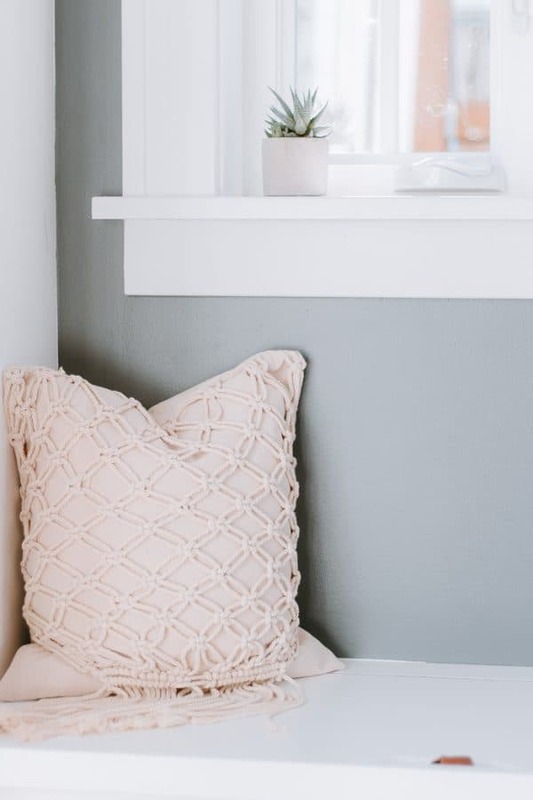 For this Pillow, you can either start with a pillow cover you already have or make a quick envelope pillow cover. But don’t make it just yet – see Step 5 first. I made a quick pillow cover out of this drop cloth. It ended up matching the rope perfectly and it looks great. If you really want to make the macrame pop, however, choose a contrasting color for your cover. For reference, my cover is 20×20 inches. 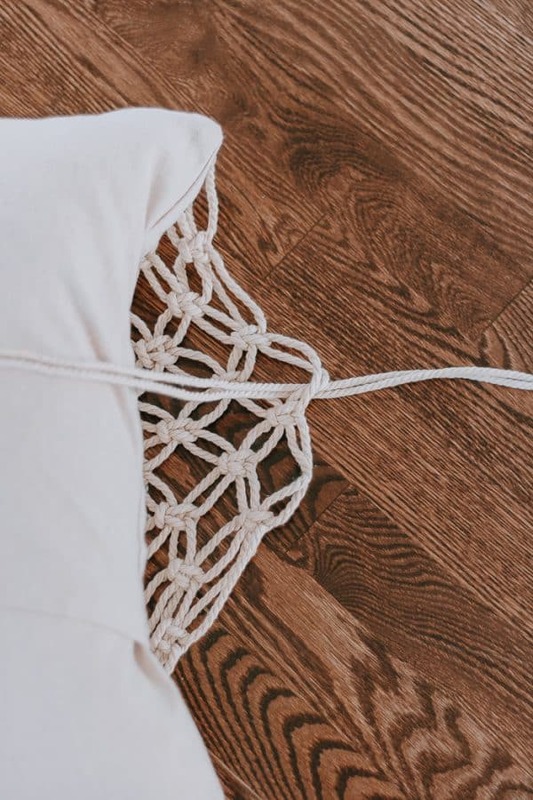 You want to make sure your macrame pattern will cover your pillow – but the good news is you can stretch it to fit if need be. Cut your cords! You will need 16 – 12 foot cords to make this pattern. (And you will have a bit of excess depending how long you want your fringe). Attach all 16 of your cords to your dowel using reverse lark head knots. Refer to the Basic Macrame Knots Post to see how to do this knot. The pattern for this cover is just rows of 1 alternating square knot. I left a bit of space in between each knot – about half an inch for reference. Plus, leaving a bit of spacing helps the project go that much faster. You want to continue to make your alternating square knots until you reach near the bottom of 20 inches. Use your tape measure to keep track of where you are. Once you reach the bottom, make a two horizontal rows of (left to right, then right to left) or double half hitch knots. Now that we are finished with the pattern, cut the excess off the bottom, but leave a bit of fringe hanging – I left about 5 inches or so. You can leave more or less, totally up to you. Step 5 : How do I attach this to my pillow cover? 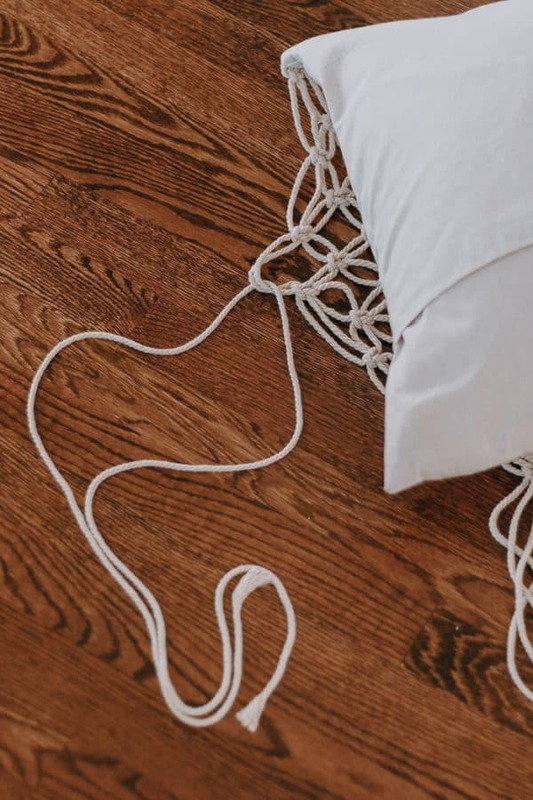 Here’s how you can attach your macrame pattern to your pillow. 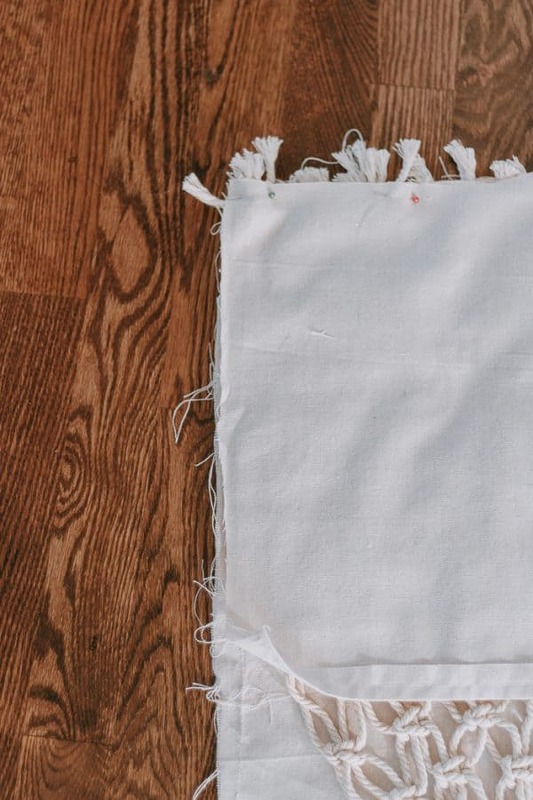 If you are making a cover yourself, before you sew it up – you are going to basically line up the pattern to the front of your cover leaving the cut ends over hanging the top a bit. lay the back piece on top and pin it! 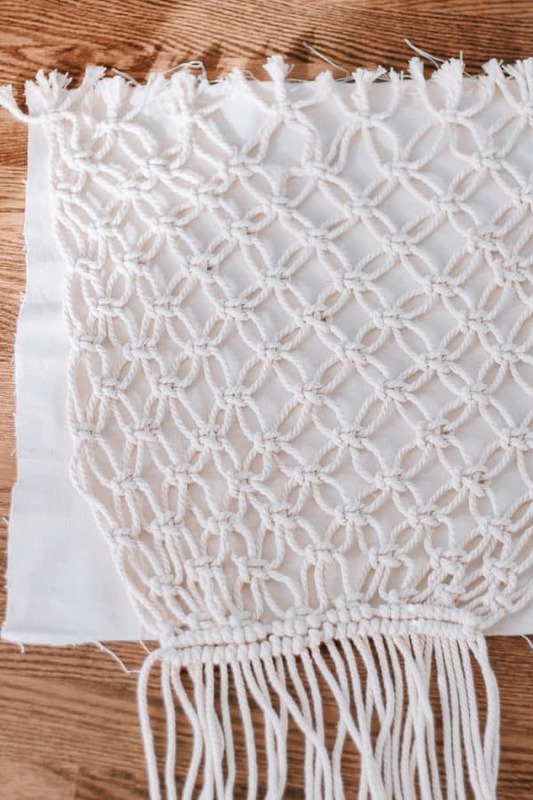 Lay the back piece over top of your cover and macrame pattern- right sides facing together – basically you are making a sandwich here and the macrame is considered the “meat”. 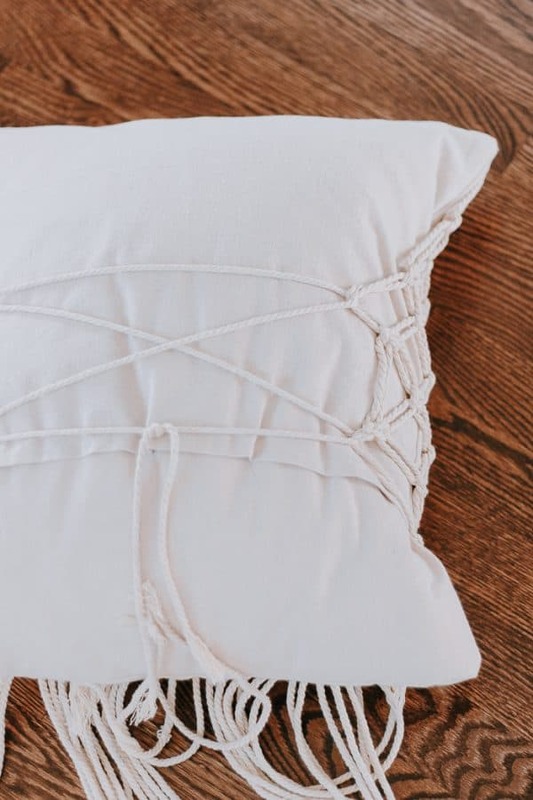 Now just sew the top seam of your pillow cover – go over the ropes too! It takes a bit of finesse, but you can do it. I pinned it to hold everything together. 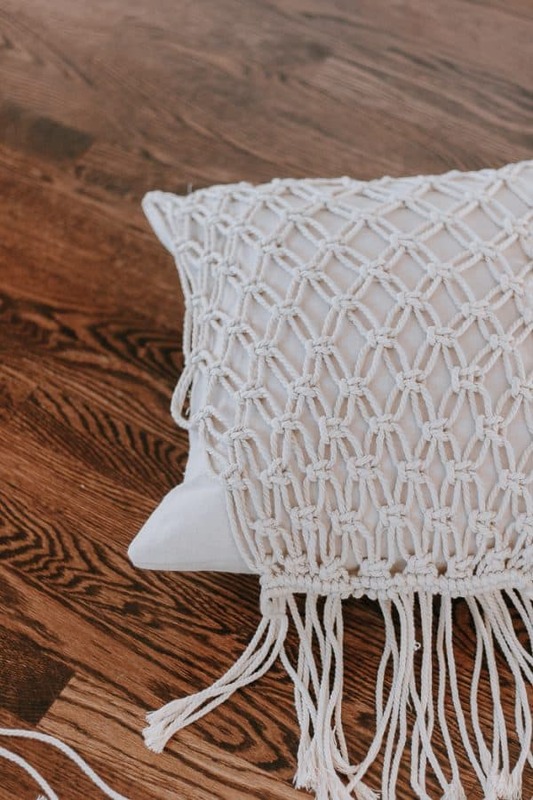 To sew the rest of your cover, shove the macrame pattern inside your pillow and sew the rest of the seams as normal. Flip it right side out. 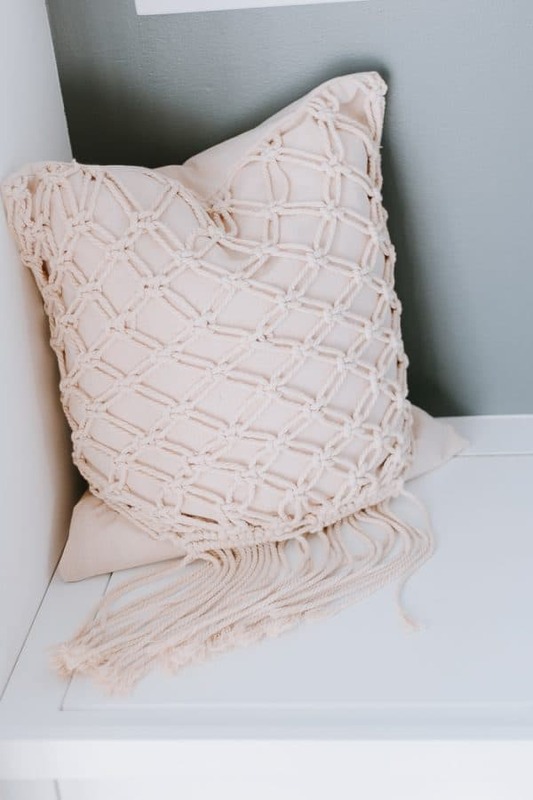 You should now have your macrame pattern attached to your pillow at the top (coming out from in between your seam). To attach the rest of the cover – I took another piece of macrame cord and tied a simple knot in the back. You will never really see the back so who cares. I looped this cord in and out of square knots. This will not only help stretch your pattern out, but it will secure it down towards the bottom. Take a cord and loop it through your pattern …. do this several times (criss cross) and knot it! And that’s it! Your fringe will be left hanging from the bottom. 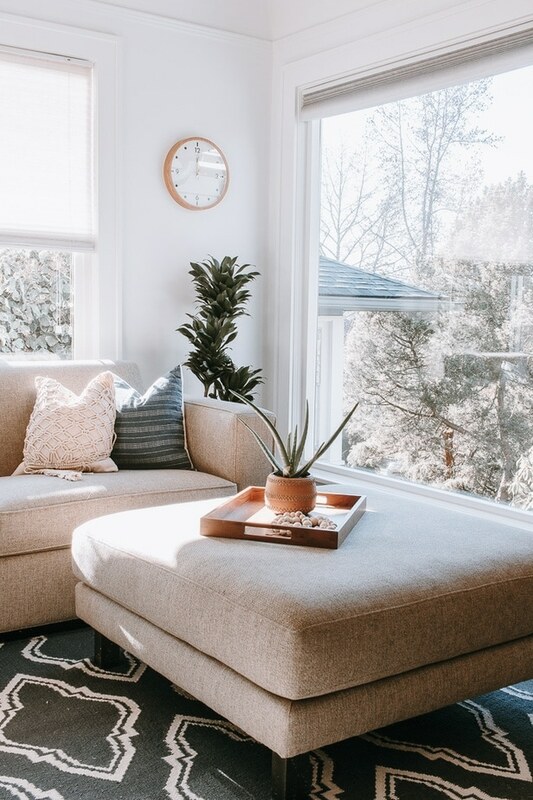 What if you have a ready made pillow cover? Well – you can cut one of the seams open and follow the steps above but I’m guessing you aren’t going to want to do that. So just take another piece of macrame cord and loop it through the top and knot it to the back. You should still knot the sides too as described above. Or, you can hand sew this to your cover as well. To recap this week of Macrame, here are all the other projects we completed! Until next time! Thanks so much for following along here!